If it ain’t broke, don’t fix it — just jazz it up a little. 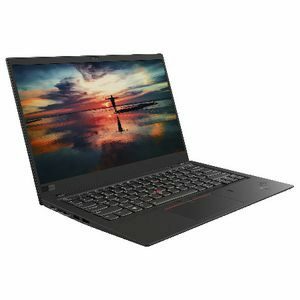 One of the sveltest 14-inch laptops you can get, the ThinkPad X1 Carbon has the same, slim dimensions (12.7 x 8.5 x 0.6 inches) and 2.5-pound weight as the laptop’s immediate predecessor. It also has the same, luxurious soft-touch lid and deck, which makes gripping and resting your wrists against the laptop a joy. However, Lenovo has made some subtle changes to the branding. The ThinkPad logos, which appear on the deck, are both black rather than the usual silver. And there’s a classy new red-and-gray X1 logo on the lower left corner of the lid. Though our X1 Carbon review unit was the traditional ThinkPad black, the laptop is also available in a dark silver color, which does not have the same soft-touch texture. The X1 Carbon is so light that it compares favorably even to competitors with smaller, 13-inch displays. This ThinkPad weighs 0.16 pounds less than the Dell XPS 13 9370 (2.65 pounds), 0.51 pounds less than the MacBook Pro 13-inch (3 pounds) and 0.4 pounds trimmer than the Dell Latitude 7390 (2.9 pounds). Granted, X1 Carbon’s 0.6-inch thickness makes this machine a tad chunkier than the XPS 13 (0.46 inches), but the Dell has only Thunderbolt 3 ports, while Lenovo’s laptop finds room for some full-size USB 3.0 connectors. Made from a combination of carbon fiber and magnesium, the X1 Carbon is not only light but also extremely durable. According to Lenovo, the laptop has passed a dozen MIL-STD-810G durability tests, including those for extreme temperatures, shocks and vibrations. The laptop supports dTPM encryption and optional Intel vPro manageability. Our review config had an Intel Core i5-8250U CPU, which doesn’t support vPro, but you can get the X1 Carbon with the Core i7-8650U, which does. The X1 Carbon comes standard with a Match-in-Sensor fingerprint reader, which performs all of its storage and analysis on the same chip, in order to avoid hackers. Prior ThinkPads would send that data to other parts of the computer, where it could be vulnerable to sophisticated attacks. There’s an optional infrared camera that will allow you to use Windows Hello facial recognition. If you don’t get the IR camera, you’ll have the standard webcam, which comes with the ThinkShutter, a physical cover for the lens. If the ThinkShutter is closed, there’s no way that even the world’s best hacker could capture images of you. We tested ThinkPad X1 Carbon laptops with two different screen options: the 2560 x 1440 HDR (high dynamic range) screen (nontouch) and the standard, 1920 x 1080 touch panel that comes on the base model. Both 14-inch panels were impressive, but the HDR display was one of the most vibrant we’ve seen on any laptop. When I watched a trailer for The Incredibles 2 on the 1920 x 1080 display, colors like the red in Elastigirl’s costume and the green in some trees really popped. Fine details like the lines in Mr. Incredible’s head were sharp, and colors stayed true at up to 90 degrees to the left or right. The colors on the HDR screen were on another level; the reds and blues were so deep and saturated that it reminded me of the best phone OLED phone screens and of the beautiful OLED screen on the Alienware 13. Just staring at the reds in the X1 Carbon’s desktop wallpaper was an engrossing feast for my eyes. It’s important to note that in order to take full advantage of the HDR panel, you need videos and software that specifically support Dolby Vision HDR. Netflix, Amazon Prime Video and Vudu all have some movies and shows that will stream in Dolby Vision, but at the moment, Windows 10 doesn’t support the standard (an update is coming this spring). However, even without Dolby Vision support, the HDR display is one of the best we’ve seen. In addition to the two panels we tested, Lenovo also offers a 2560 x 1440, non-HDR, nontouch display that tops out at 300 nits. If you plan to listen to music on the X1 Carbon, plug in some headphones or pair it with some Bluetooth speakers. When I played AC/DC’s “Back in Black,” the audio was loud enough to fill my dining room, but the instruments were so tinny and distorted that I couldn’t bear to listen to the whole thing. By default, the Dolby audio software automatically adjusts itself based on what app you’re using, but you can also manually select a sound profile for voice, music, gaming or other scenarios. The ThinkPad X1 Carbon offers the kind of world-class keyboard we’ve come to expect from Lenovo’s business laptops. With a deep, 1.8 millimeters of travel and a strong 2 grams of required actuation force, the keys offer excellent tactile feedback and never caused me to bottom out during testing. The soft-touch deck also made my wrists feel really good while I was typing. Because of the keyboard’s great comfort and responsiveness, I achieved a rate of 109 words per minute with a 3.5 percent error rate on the Ten Fast Fingers typing test. That’s one of the highest scores I’ve gotten and above my typical 95- to 105-wpm range. As with other ThinkPads, the X1 Carbon offers a red TrackPoint that sits between the G and H keys. Using this pointing stick to navigate is more efficient and precise than using any touchpad, because it allows you to move around without lifting your hands off of the home row. Given the choice, I will always use the TrackPoint instead of the touchpad, but not everyone feels comfortable pushing a nub. The 3.9 x 2.2-inch buttonless touchpad was extremely accurate throughout our testing and didn’t exhibit any jumpiness or stickiness. It also responded smoothly and immediately to multitouch gestures such as pinch-to-zoom and three-finger swipe. Equipped with a quad-core, Core i5-8250U CPU, 8GB of RAM and a 512GB NVMe PCIe SSD, our first review configuration of the ThinkPad X1 Carbon handled everything we threw at it. Whether we were crunching large spreadsheets, compressing videos or just surfing the web, the laptop was always speedy and responsive. We also tested a model with an even-faster Core i7-8550U processor, which performed a little bit better.